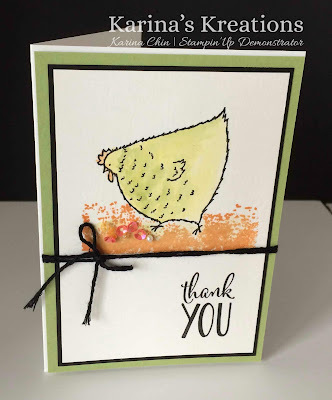 I love the Hey Chick Sale-a-bration stamp set! You can get it for FREE with a $60.00 order. Another product I love is the Stampin'Up Note Cards and Envelopes #131527. You get 20 in a package for $8.00. The card stock is pre-scored. These cards save me a lot of time. I stamped the chicken image with black archival ink on Shimmery White card stock#101910 and colored it in using and aqua painter. I used So Saffron, Peekaboo Peach and Pear Pizzaz ink to color my image. The background was made with the Timeless Texture stamp set #140517 and the greeting is from the Happy Happenings stamp set #139381. I aded some Black Baker's Twine #141682 and Sprinkle Embellishments $142741 to my card. If you live in Canada, this link takes you to my Stamping Store!